We’d love your help. 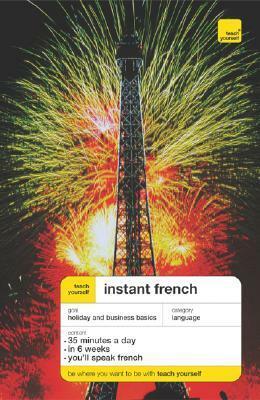 Let us know what’s wrong with this preview of Teach Yourself Instant French Package by Elisabeth Smith. The most effective program for learning French--now with double the audio! Even if you have failed in traditional language-learning courses, you will succeed with "Teach Yourself Instant French"! In just 35 minutes a day for six weeks (including one day off each week), you will be able to speak confidently in your new language. As you become involved with the program's intr The most effective program for learning French--now with double the audio! Even if you have failed in traditional language-learning courses, you will succeed with "Teach Yourself Instant French"! In just 35 minutes a day for six weeks (including one day off each week), you will be able to speak confidently in your new language. As you become involved with the program's intriguing storyline, you will pick up the words and phrases integral to basic conversations. To ask other readers questions about Teach Yourself Instant French Package, please sign up.